The program FTIN is an arithmetic calculator that calculates in feet-inches and square feet. 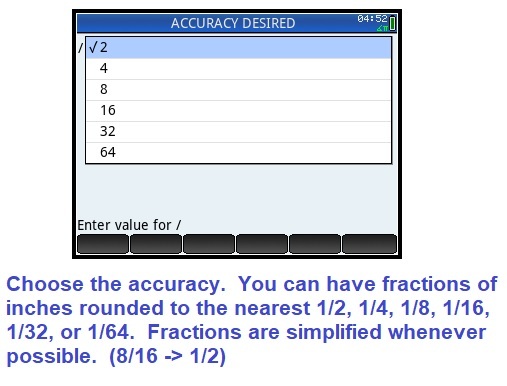 At the start of the program, you will be asked to set an accuracy setting for fractions of inches. The options available are 1/2, 1/4, 1/8, 1/16, 1/32, and 1/64. You can change accuracy settings at any time. Then you will be asked to enter a measurement either in feet-inches (linear) or square feet (area). In feet-inches entry mode, you will enter the feet, whole inches, and fractional components of inches separately (see screen shot below). When the main menu appears, your current result appears in the title screen of the choose box. 3. Multiply by scalar: Multiplies measurement by a scalar. Use this to find the total multiple of a feet-inch measurement. 4. Divide by scalar: Works similarly to option 3. 5. Multiply to area: Multiplies two lengths in feet-inch to obtain an area in square feet. 7. Square Root from area: Takes the positive square root of a square area. It’s good for a finding a length of a square given its area. 8. Change accuracy settings: Change the accuracy settings for fraction of an inch. Option 9 is to exit the program. * An item up for bid is presented to four contestants who directly called from the audience. Whoever gets closest to the actual retail price without going over wins the prize and plays a pricing game. This cycle occurs three times. * The three winners play in a Showcase Showdown, where they spin a wheel. The goal is obtain a score closest to one dollar without going over. The winner advances to the final Showcase round. The third segment is the Showcase round played by the two winners of the Showcase Showdown, where prize packages worth thousands of dollars are at stake. This blog will present a simulation of the Showcase Showdown. Like the game show, the amounts are shown in cents, where 100 represents one dollar. This program simulates a single spin. The spin starts on the dollar (100) space. The space that the pointer is in red with arrows pointed at it. You can use the program on monochrome screens if you wish, just not type the color commands (Black, Red). Note: The lines .1+.4K and the second For loop that follows it is to simulate the wheel that slows down as it spins. Now, if you want a complete simulation, check out the HP Prime program TPIRWHEEL. 2 Player Spinoff: This is a one spin playoff between two players. 3 Player Normal: This is a normal game between three players. Each player may have up to two spins. If the score exceeds 1 dollar, the player is out, and given a final score of 0. When entering the names, you do not need to worry about entering the quotes. Should a player get 1 dollar in one spin or their score from two spins add up to 1 dollar, then the player gets a bonus spin and wins $1,000. The bonus spin always starts from the 5 cent position. Unlike the game show, all bonus spins are taken immediately. Landing on the green 5 cents and 15 cents spaces wins $10,000, while landing on the red dollar space on the bonus spins wins $25,000. The amount on the bonus spin does not affect the player’s final score. The end of the game will lists the players and their final scores. The program is over 10,000 bytes in memory. // did the player go over? All original content copyright, © 2011-2018. Edward Shore. 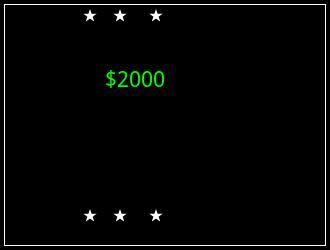 This is a simple game where the machine randomizes between $250 to $50,000. Press [ Enter ] whenever you feel lucky. Good luck!